52-Series 7.25” driveline packages feature a family of matched components to offer the highest level of performance and reliability. 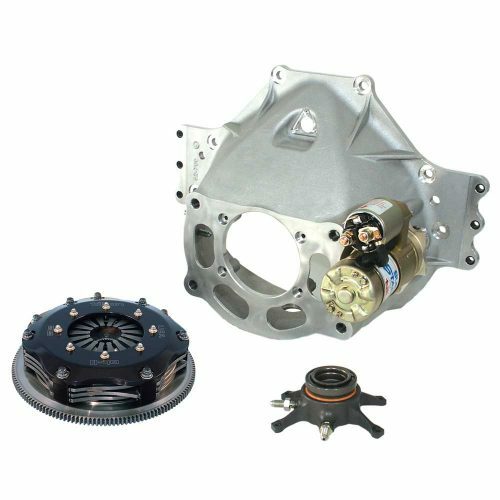 Designed for applications that require a compact bellhousing for ground clearance, rear-starter, small diameter flywheel, and a 7.25” clutch. Rigid aluminum bellhousing resists flexing, allowing maximum power to be transferred to the wheels and minimized wear to driveline components. Integral mounting “ears”, with flanged inserts, for use as a rear engine mount. Bulkhead-mounted fittings for release bearing hydraulic lines. Provisions for cam-driven fuel pump. Blueprinted for parallelism and concentricity. 7.25″ OT-II metallic clutch assembly provides race proven performance and reliability. Clutch discs feature 8-rivet hub design for maximum attachment strength. Billet steel 110-tooth (9.16″) flywheel offers low inertia, precision balance and reliability. Clutch mounting studs provide high strength and simplified clutch installation/removal. Billet aluminum body and piston. Built-in positive stop limits piston travel to prevent over-stroking of the clutch. High temperature quad tensioner monoseal insures a leak resistant seal. High quality 44mm contact diameter bearing maximizes clutch modulation and provides reliable operation. Compact XLT (1.6 HP) Super Starter. 40000 Series (3.0 HP) Super Starter models are also available as an option. Contact Tilton for further information. Double Reduction Drop Gear design provides smooth engine cranking. Reflective-type starter heat shield, designed to block radiant heat from exhaust headers, bolts directly to the starter (XLT only).